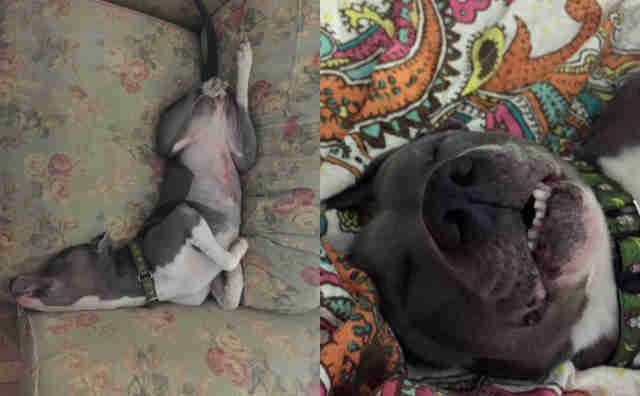 It was the first time she'd been able to relax since she was returned to the shelter. 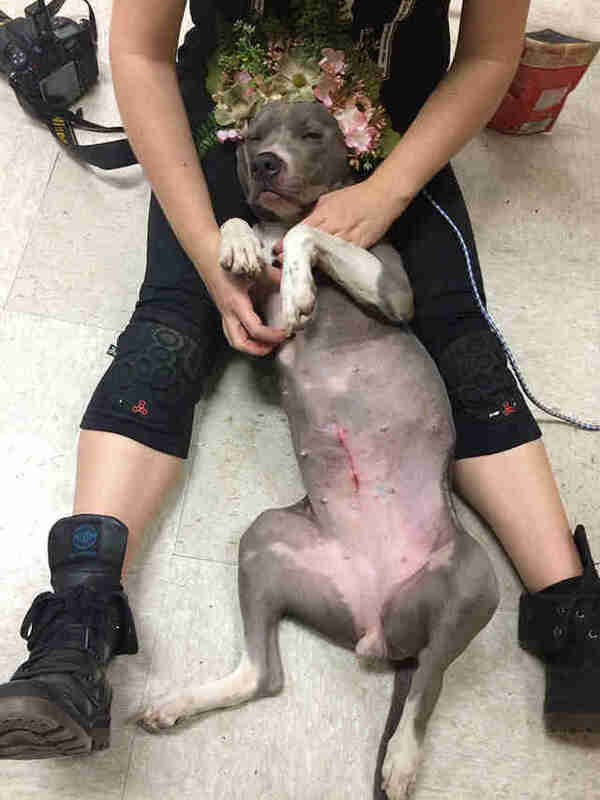 Patsy, a 3-year-old pit bull mix, has been having a rough time with shelter life while waiting to be adopted. 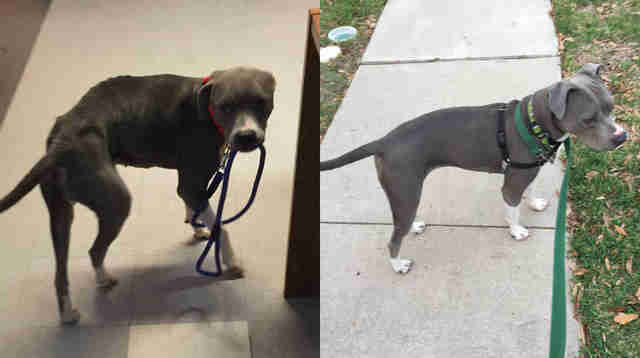 Patsy, who currently resides at Austin Pets Alive (APA) in Texas, suffers from anxiety while being surrounded by other dogs, so living inside a busy shelter has left her constantly stressed. Patsy combats her stress with anxious chewing, and will gnaw on anything within reach if she senses the presence of another dog. Patsy first came to APA in October 2015 as a stray, and was briefly adopted into a home with another dog. 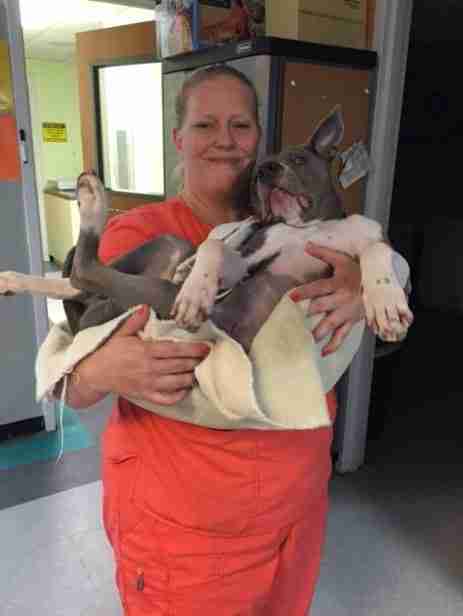 However, Patsy and the dog began having problems and her owners eventually returned her to the shelter in January 2016 - emaciated and with severe gastrointestinal problems. 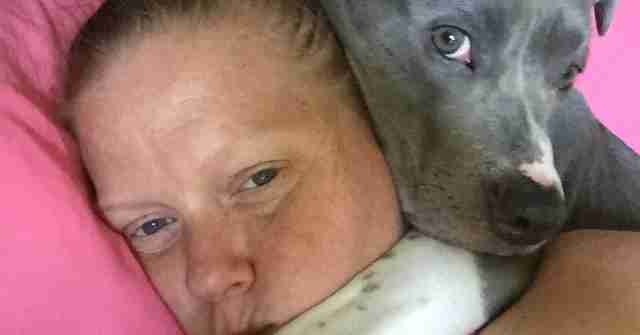 Surgeons soon discovered that plastic, part of a leash, rope and a large strip of velcro were the culprits of Paty's stomach trouble. After purging a few pieces of rope, medical staff determined that Patsy needed immediate exploratory surgery. Today, because of her stress chewing, Patsy cannot have beds, blankets or toys in her kennel - which makes her stay at the shelter even lonelier. But her anxiety doesn't match the sweet personality those who've met Patsy have come know. "If you want to lay in bed all day, she's perfectly fine laying in bed all day. She's not a bouncing-off-the-walls kind of dog,." Rene Backer, who fostered Patsy for nine months after she was returned by her adopter, tells The Dodo. During that time, Patsy enjoyed cuddling and being as close to Backer as possible. Though Patsy is still rather young, Backer describes her as being a "low-to-medium energy dog" who doesn't need long periods of exercise. In fact, Patsy has some hip dislocations that limit her to "occasional zoomies," and prohibit long runs or extensive activity. Recently, however, Patsy was singled out for a special treat. 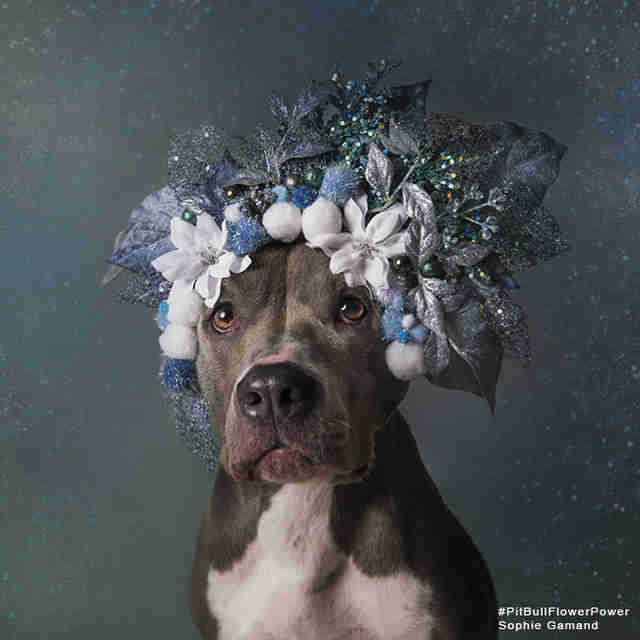 Patsy received her very own photo shoot and some extra pampering with photographer Sophie Gamand to help get her a home - and the anxious pup immediately relaxed. 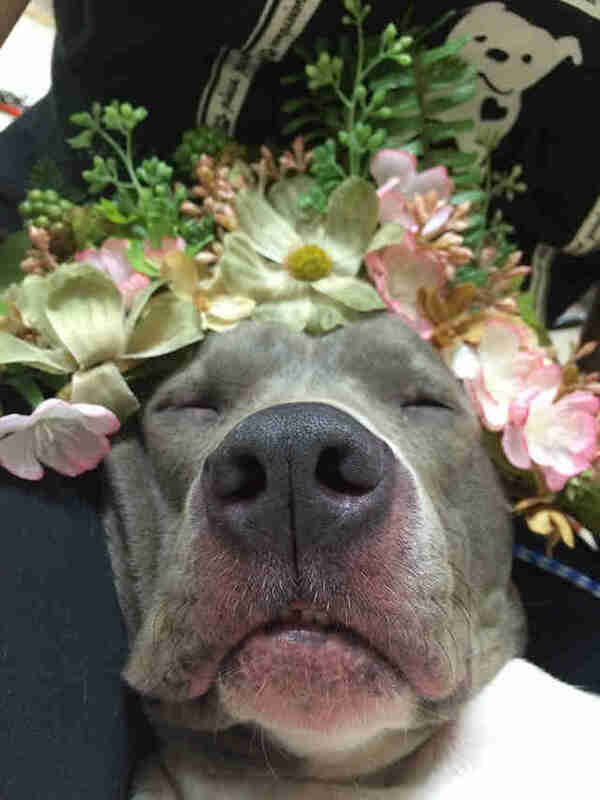 In fact, she walked over mid-shoot to lay her head in Gamand's lap, and fell fast asleep. It was perhaps the first time in weeks since her return to the shelter that she was able to truly relax. Her soft snores can be heard in this video while she takes a snooze. Gamand teamed up with Erin Stanton, founder of Susie's Senior Dogs, during the summer of 2016 to combine efforts and save as many shelter dogs as possible through these photo shoots, which provide extra visibility to adoptable dogs waiting for forever homes. "I have a long waiting list and Erin has a ton of contacts all around the country," Gamand tells The Dodo, "so we just go through our lists and figure out who might benefit the most from our visit, who would fully take advantage of the opportunity, etc. Then we just plan!" "Patsy has a huge heart and it breaks mine to think she hasn't found her happy place yet," Gamand wrote in an Instagram post. With the cold weather approaching, for Patsy to remain in a kennel without a bed, blankets or a coat isn't ideal on top of the stress she is already experiencing. 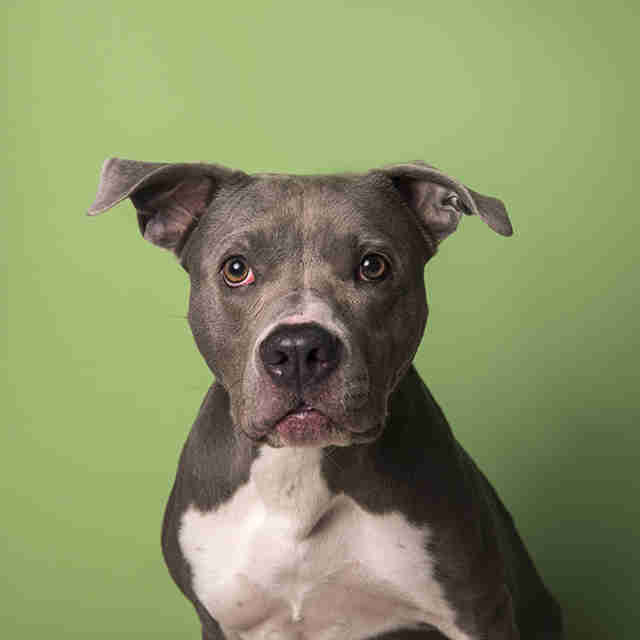 APA would love to find her a pet-free adopter or foster home to continue helping her work on her anxiety issues. She is house and crate trained, and is very sweet and loving to all humans she meets, according to Backer. 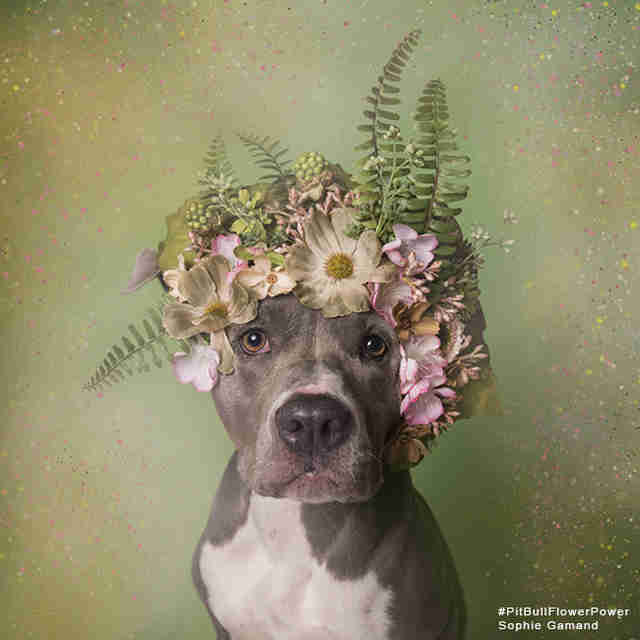 Stanton continues to feature senior dogs on her Instagram and Facebook pages to help find them homes, and Gamand keeps photographing dogs like Patsy with her famous "pit bull flower power" crowns. They have visited shelters in Atlanta, Alabama and Texas, to name a few, and have plans to keep visiting as many as possible in the coming year. If you are interested in adopting or fostering Patsy, please email Austin Pets Alive at adopt@austinpetsalive.org. Also, be sure to follow Sophie Gamand on Facebook and Instagram, and you can help fund her work and trips to shelters by purchasing some of her amazing merchandise here.